In this month’s issue of Scientific American, an article on creativity states: symbols are the single most important indicator of the modern human condition! Some cave paintings are older than 41,000 years. Empirical data has dated flutes to 43,000 years ago, and the first musical instrument (other than the human voice); the drum is perhaps many tens of thousands of years older. Localized creativity from bone and stone flutes in northern Europe to drums in Africa and Asia. It’s a moot point whether this early musicality was used as a form of communication or as entertainment. It was creative. The music of the ‘50s and ’60s Pacific Northwest was certainly a unique thing. I will not pretend to say that I grok (apologies to Heinlein) this experience, you see, I’m not from here…for 30 years now. You really had to have been there (apologies to Jimmy Buffet). Draw a 300-mile circle around N.Y.C. and you could be in Montreal, Boston, Pittsburgh, Baltimore, Philly, D.C. or Richmond, VA. A like distance around Seattle barely gets you out of the state. So a certain degree of provincialism may have contributed to the Northwest’s musical identity. Many Northwest elders proudly aver: we were in the boondocks and only the Seattle World’s Fair put us on map. People who grew up here, speak with reverie and in marked tones of “knowing,” and I took no offense when one such person recently expressed such a sentiment: “Oh you didn’t grow up here? Well you wouldn’t understand” (as most would not understand Greenwich Vil-lage or the French Quarter in the ‘60s). But I will try to convey some of that esprit with some words with the Northwest’s guru of music bands; Jeff Miller (owner of Golden Oldies Tacoma) and author of the forthcoming book, A pictorial history of Northwest Bands. PV: What was so unique about the music of that era? JM: The scene was heavily influenced by jazz and R&B. in their formulate days these bands would venture to the Evergreen ball room (Olympia) on Sunday nights and perhaps borrow some stage moves. It was an infusion of blues, jazz, R&B and rock. A distinct flavor differ-ent than any-thing else. There was a recording studio not far from your store here on 6th Avenue who recorded there? It was Wiley Griffith Studios. 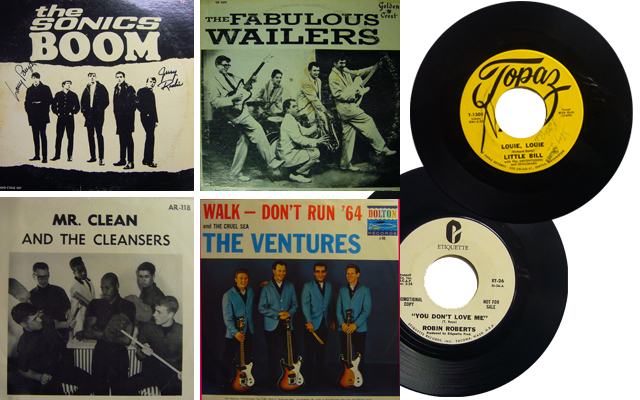 The Sonics, the Wailers, the Galaxies and many Country and Western bands recorded there. The place was active until the early ‘70s. Radio was crucial for local talent. What stations and DJs promoted this music? Pat O’Day in Seattle and Bob Summeriose in Tacoma. Two big stations of the era were KJR and KOL. What were some of the local venues? The Spanish Castle, (yes Jimi’s Span-ish castle magic) several Eagles Halls, The Knights of Columbus Hall, the Armory, and the Arena which is still used during Bumbershoot. These were all-ages clubs. The booze was in the parking lot. What were some of the hurdles these bands had to overcome? Remember these were the early days this new kind of music. Many local high school music teachers hated R&R and would bad mouth the genre. Ironically, many of these kids were already in working bands and most likely making more money than those teachers. A few words about subsequent NW bands? Nirvana, Pearl Jam, The Decembrists, The Dandy Warhols, all have added to a fine musical tradition that has sprouted in this area. Thanks Jeff. See ya around campus (yes Tacoma is a small town). I recently had a conversation with Michael Fremer, the All Thing Vinyl/Analogue guy. If you have not seen this YouTube piece, dial it up. It’s a short video concerning the proper sleeves for proper vinyl storage. Funniest short I’ve ever seen. So anyway… I suggested to Michael a subject for a new book. He responded; why go there; it’s all on the Internet. Aaaahh, the good ole Google Machine. So might I suggest some further reading? Jimi Hendrix and the Spanish Castle connection. The Ventures/Japan connection and the inside story of “Louie Louie.” Bon appétit.